SW-Motech Hard Luggage Carrier: next generation of luggage carrier. The SW-Motech Hard Luggage Carrier (Quick-Lock EVO carrier) is next generation of luggage carrier by SW-MOTECH. Same, great Quick-Lock design, but with a more robust, tubular steel rack that has an even more narrow profile than the original sidecarrier! The racks can be removed from the bike in less than 30 seconds without special tools by opening 3 quick-release fasteners on each side. 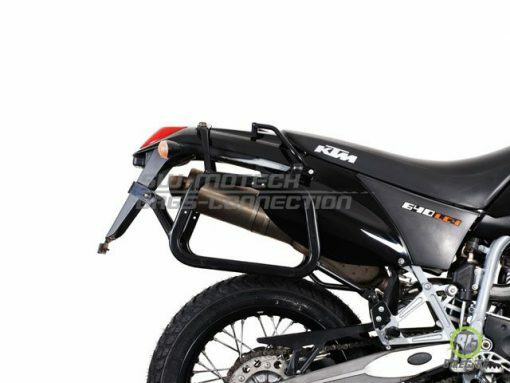 These black, powder-coated, tubular steel racks are compatible with luggage cases from GIVI (Monokey system) V2, Kappa, Shad, Hepco-Becker, Krauser, and more. Luggage-specific adapter kits are sold separately.